Two weeks ago, Ronda Rousey turned heel when she assaulted Becky Lynch and Charlotte Flair on Raw. 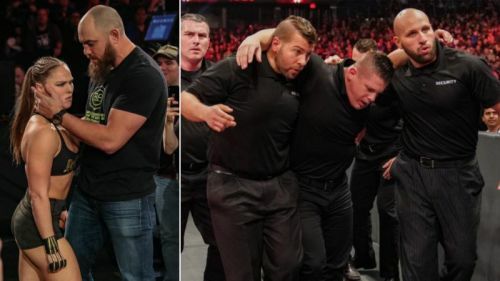 A week later, Rousey attacked Dana Brooke, and when the referees tried to calm her down, she put her hands on them too. Although WWE fined her, I don’t think it had any effect on the Raw Women’s Champion. Ronda Rousey has been fined by WWE as a result of her unprofessional actions last Monday night on Raw. Due to the confidentiality of Rousey’s contract, the amount of the fine will not be disclosed. Appropriate action has been taken. Undoubtedly, attacking an official would get anyone in trouble, but still, Ronda doesn’t care. This week, she laid her hands on the security after her match with Dana Brooke, in which she won. Let’s take a look at five reasons why The Rowdy One has been physical with the WWE officials lately. Ronda Rousey is a heel and she does get booed by the fans, but that isn't enough for her. She is the baddest women on the planet and can’t cheat in a match. This is a great way to be booed. A good (babyface) wrestler would never attack an official but the Rowdy One is doing the same. It is another way she has been coercing the WWE Universe to boo her. Moreover, it seems like she is doing the right thing as the fans have now started to treat her like a baddie. But is it the only way to get boos from the audience? In my opinion, there are still many ways left untouched, but I will discuss that in a different article.